We started something different under the Panseke Radio brand. We decided to search for a group of aspiring future broadcast professionals and celebrities. Our intention is to train them, and give them room to flourish and explore the emerging options within the communication industry. We found a clutch of them, with very promising talents and abilities, and as we groom them, we will let you read their work, listen to their presentation and maybe even watch them on our diverse online portals as we proceed. To this end, we gave them a task; organize a photo-shoot, and execute it as a group. read for yourself, how that task turned out in the "report' that we asked them to submit after the shoot. Saturday 18th of August 2018, was indeed a memorable day , as members of the Goal Diggers online groups (yes, there's more than one group) came together for a photo shoot in Abeoukuta Ogun state. Members got to meet and interact with one another, exchange contacts, play games, make new friends, and they also enjoyed a sumptuous meal with great music. Tosin Brown's place was the location for the photo shoot , group members who were present included Tosin Brown; a blogger and event host, Remilekun Toviho; a content developer and writer, Haleemah Shuaib; a budding agro-journalist , Abosede; an inspirational speaker, writer, and a lover of art, Na me chuks; a presenter (pigin English) language, Blessing; a presenter , Yemi; a presenter, Lekan Adebesin; a presenter and radio host, Queen Meena; a presenter (yoruba) and Precious Ighalo a presenter. The photo shoot began with the make up session, followed by the individual glam shots and video profile, later on, a change of outfit into casual attire for the group photo and video and desert was served. Photo shoot was wrapped and it was time to say our goodbyes and head back to our various destinations. Saturday, the 18th of August, 2018 was a great day to experience as goal diggers in Abeokuta came together for a photo session which I was glad to be the host with great assistance from Remilekun Toviho. Most goal diggers did not come on time as agreed, so the photo session started late. Each person was however able to do their individual photo-shoot and also participate in the group photos and videos in time before having to go for their other engagements. I captured some memorable moments as Lekan taught the group new stuff like the Dele Alli Challenge and the In My Feelings Dance challenge. Goal diggers who were in attendance were Remilekun, Halima, Precious, Aminat, Opeyemi, Abosede, Chuks, Lekan, Blessing and myself, Tosin Brown. It was a successful photoshoot and an awesome team bonding time. The journey to stardom begins with a step. 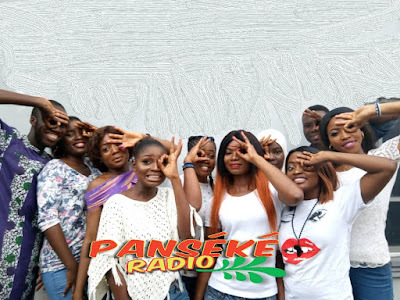 This is the situation as goal diggers, mentees of Panseke Radio converged on Sodubi in Onikolobo Abeokuta to announce themselves to the world with a photo session. The session was hosted by goal digger Tosin Brown at her beautiful apartment in a cool serene environment. The duo of Goal diggers Yemi Akanbi and Tosin Brown took on the duty of make up artistes to enhance the ladies' celebrity looks. The10 mentees meeting outside of the virtual platform for the very first time took turns displaying their skills before the photo and video camera. It was a time to connect, discover and awaken hibernating talents. The camera man, goal digger Lekan exhibited his camera handling skills to achieve the best production possible. It was pleasant to observe goal diggers approaching the session with go-getter attitude and not just a mere task to be accomplished. The host treated her fellow goal diggers to a fingermeal of fries (yam and plantain chips) crowning it with her special dessert which she calls fruity blast. The kitchen duties attended to by the host and goal digger Remikekun Toviho took up part of the time alloted for the session thereby making it start later than planned. However,goal diggers were good sport all through actual session which lasted about 2 hours with participants bonding without restrictions. As the session came to a close, goal diggers extended their appreciation and love to the convener of the Goal Digger group and CEO Panseke Radio Mrs Olufisayomi Awowade for giving them a platform to excel and make new friends. 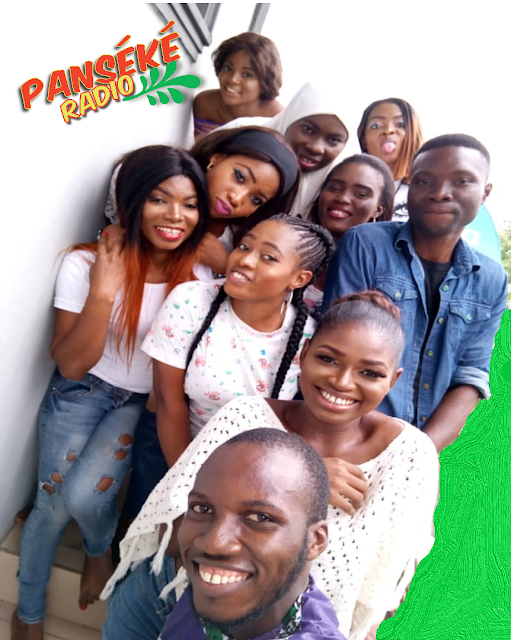 It was fun galore as members of Goal Diggers group, a subsidiary of Panseke Radio, converged at the home of one of its own, Tosin Brown for a photoshoot yesterday, and also getting to know one another since they had all been communicating via the what's app platform. The hangout was fantastic as everyone present were in their best attires, with smiles all over their faces. The weather was just so cool for a photo session, personally and together as a group. Tosin Brown the host, was dressed in an amazing yellow gown that was sequined, Remilekun was also in a simple but classic gown, Yemi Akanbi, the make-up artist did some transformation with her hands on the face of Agbeetan Blessing, the clown, she was so Jenifa-'ish' all through the day. QueenMinah was free but a bit reserved, probably due to her nature. Lekan Adebesin assumed the role of a director of photography immediately everyone had arrived and he made sure everyone had pictures taken. Chuks oh Chuks didn't talk much, I guess he's the quiet type. Abosede was dressed in a jean trousers, cool top and a simple make-over. After the photo session, it was time for videos, everyone had their videos recorded; it entailed a short profile of everyone, their hobbies and aspirations. For lunch, fried yam and plantain with ketchup was available, and then the host made fruit splash for dessert. And then,at the end of the hangout, all celebrities present hugged one another, exchanged contacts and promised to keep tabs on each other, being new friends and all. The management of Panseke Radio organised a photo shoot session for its members on the Goal diggers platform. The aim of this exercise is to enable the Goal diggers come out of their shells and discover themselves as well as to help build the confidence that O.A.Ps need to grow and flourish in the media industry. It was also an opportunity for the Goal diggers to get acquainted with themselves. The theme of the shoot was to look glamorous just like celebrities. There was also a group photograph in casual but uniform wears. Short video clips were also made where the Goal diggers told us about themselves and their aspirations. The goal diggers platform was established to groom and train aspiring O.A.Ps into the best that they need to be. Panseke Radio was established to project the image of the town and its environs and take over the airwaves by so doing. 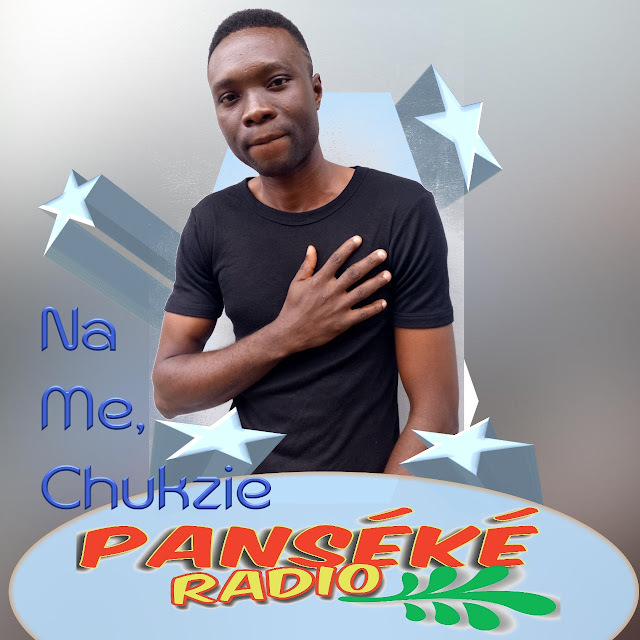 Watch out for Panseke Radio as it will shake the radio industry! Keep your fingers crossed as this station is about to "Wow" you! It was all fun and excitement yesterday, Saturday, 18th August, 2018 as goal diggers in Abeokuta came together for a photo session which later turned out to be a mini party and the beginning of new friendships. Tosin Brown proved to be an excellent host as she swept the other members off their feet with her flawless culinary skills and exceptional hospitality, of course, she had Remilekun to help her. The photo shoot started late because some members had other engagements and could not come at the agreed time. The ladies contributed to the late start, as well, with their long hours of making up but one would agree it was worth it because they all looked glamorous. Lekan taught the group how to do the Dele Alli Challenge and the In My Feelings Dance. All of these and more were captured in video by Tosin for her vlog on YouTube. There was enough food and drinks to go around with lots of laughter, music, dance and play. Goal diggers who were in attendance were Remilekun, Halima, Precious, Aminat, Opeyemi, Abosede, Chuks, Lekan, Blessing and Tosin. It was an exciting gathering that should happen again, soon. with a branch in Abeokuta on Saturday organized a photo-shoot session for her crew. The state coordinator for the gathering, Remilekun, collaborated effortlessly with the host, Tosin, to ensure the success of the shooting. members talking, gisting, playing, dancing and having fun. Meanwhile, the crew has expressed excitement over the photo-shoot session seeing it as an opportunity to connect with friends since all work and no play makes jack a dull boy. It was all glitz and glamour as the new members and old members of Panseke Radio met at a get together at kolobo, Abeokuta for the first official meeting of the group as the group interacts only online (WhatsApp) usually. The meeting was set up by the convener of Goal diggers to serve as a means to bring the members together. Another member said " I'm so happy to meet you all". It was all good and glamorous as all members danced, ate and took lots of pictures. A real definition of edutainment. 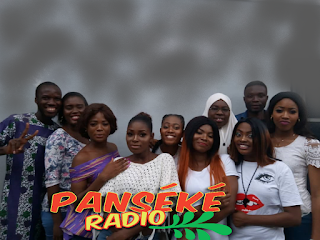 Panseke Radio crew, also known as 'Goal diggers' gathered yesterday, August 17, 2018 at Sodubi Estate Abeokuta, to have a photo session and to also get to meet themselves. from all walks of life to tell their stories and share ideas. The photo shoot which had in attendance, Precious, Blessing, Chucks, Lekan, Abosede, Opeyemi, Halima, Remi, Amina, started with individuals first going for their personal shoot after which a short video was done their personal profiles too. The session also doubled as a get together time for some of the crew as they also had the opportunity to meet new members and rub minds. The session ended on a light note as the host, Tosin, served refreshments amidst merriment. Mrs Olufisayo Awowade organized a photo session which was held in Sodubi, Abeokuta, Nigeria on August 18, 2018 at 9:00am for goal diggers. Lekan Adebisan was one of the participants who was opportuned to attend the photo-shoot and when interviewed, he said there was music for everyone to dance to, food and drinks were surplus. After the photshoot lekan thanked the organizer of the program for her effort in putting things together and for introducing him to new friends which he met at the studio. Meanwhile, Goal diggers who attended the photoshoot dressed like celebrities and females came with their makeup kits and sum of one hundred naira was paid by each participant for the purchase of data for uploading the photos to google drive. Mrs Awowade congratulated everyone who made it to the venue and promised that there would more interesting events for those who stick with the Goal Diggers train. If there is any doubt Nigeria's broadcasting is gaining global appreciation, that doubt has been put to rest,with Panseke Radio and her Musketeers reviving Truth, full information, objectivity and accuracy back to broadcasting in Nigeria. Furthermore,with great minds and great voices like Lekan, Tosin, Ope, Blessing, Haleemah, Amina, Chucks, Precious and Mrs Olufisayomi, Panseke Radio will take the whole world by storm to give good voice to the voiceless. We are Flamboyant! We are the new face of broadcasting! We are Panseke Radio! All of these reports are amazing. They all captured the moment in their different ways but I'd say Remilekun, Haleema and Blessing's has a close semblance to journalistic reports. Yippieeeeeeeeeeeeee. Goal Diggers all the way. Wawu! God bless the visioners behind this initiative. At a time when young people are almost at the verge of giving up hope in taking the next and bold step in the pursuit of their media career... May the aims and objectives of this concept not be defeated. Well, for me, of all the reports from young and vibrant talents, i give it to Ighalo Precious. Her slug(supposed headline) remains the most catchy, and it resonates more with the aim of the meeting. It was an hangout; celebrity hangout. Plaudit for her sense of humour and witty qualification of fellow celebrities present. Her lead, body and conclusion is close to perfect. Remikekun Toviho did pretty great too. We all did fantastically, honestly. May we all continue to grow at the birth of each day. P.S: The growth has to be an intentional personal decision. Am super proud of my sister Precious Ighalo and you all goal diggers.